If you are looking for a Golden Eagle house, then prepare to be blown away with the values that you will find today. Currently, there are 41 MLS listings featuring a Golden Eagle house, and you can have your choice of lakefront, golf course frontage, or a home on an interior lot. 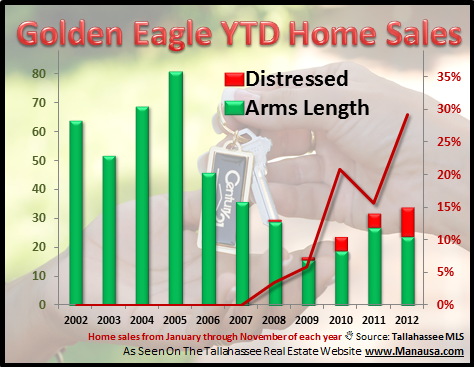 The number of distressed homes for sale in Tallahassee is rising, and Golden Eagle house sales have certainly been impacted. Looking at the real estate graph below, the red line measures the percentage of homes sold that were done so under conditions of distress (short sales, foreclosures, pre-foreclosures, and bank owned properties). 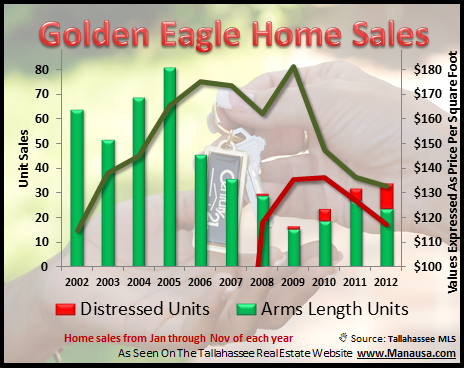 Through November 2012, roughly 30% of all Golden Eagle house sales have been distressed sales. Golden Eagle house values have been falling steadily since 2006 (the blip in 2009 is due to a singular $4.25M home + property sale that skewed the data). The increased competition from distressed home sellers is evident when we look at the market in segments. In the real estate graph above, arms length home sales are shown in green, while distressed home sales are shown in red. Thus far in 2012, the average value of a non-distressed Golden Eagle house has trended down to $133 per square foot, down 24% since 2006. 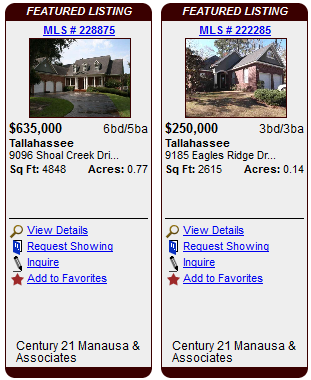 The follow list shows all Golden Eagle house sales in the Tallahassee MLS, going back a few years. Note how far down recent prices have come! Is it time for you to buy one? If you want the best insight and assistance for buying or selling a Golden Eagle house, just drop me a note and we can schedule a time to meet and discuss your desired objectives, you'll be glad you did!